New timing belt was installed, with crank, intermediate shaft, and cam in correct positions. 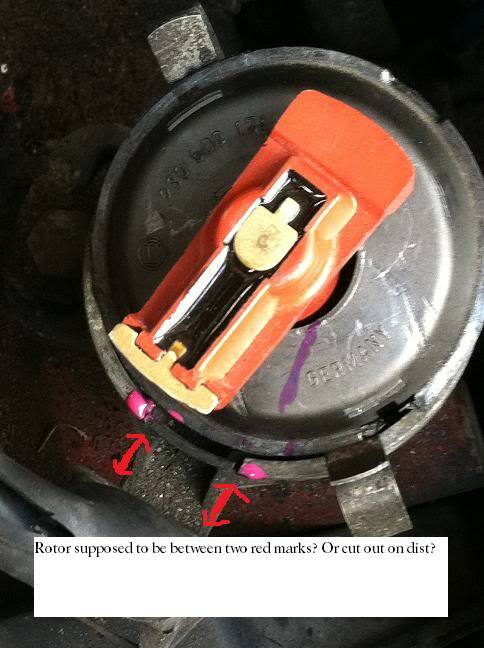 What is correct position for rotor in relation to distributor cap? When looking at this photo below, were would center of rotor be in relation distributor-cap's hole number one electrode? Thanks...I was using that line mark on distributor, but when examining distributor-cap's hole #1, the center of the rotor is a bit clockwise. Engine starts, but shakes at idle, then smooths out with RPM, which may suggest when timing is advancing, rotor is not sending spark to 3rd hole. No power. The centerline of the rotor will be past the disti groove when at TDC. When running, the spark fires ~ 5 to 20 degrees earlier (10 to 40 crank degrees), so the alignment is OK. If it's rough at idle, check that all the plugs wires are fully seated and that the injector connectors are seated too. You can try a power balance test, where you pull one injector connector at a time, and see if they all cause about the same drop in idle. 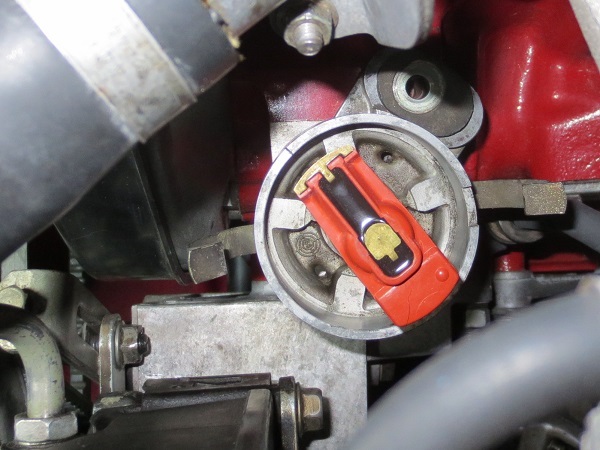 If one injector makes no difference, then that injector or spark plug isn't working well. RE: "...rough at idle, check that all the plugs wires are fully seated and that the injector connectors are seated too." New sparks, flow tested 5 injectors (cold start + 4), water pump, water hoses, thermostat, timing belt, idler, seals (crank, cam, immediate), clutch fan, CPS, PCV Oil Trap, etc., were all done. I forgot to plug in injector 4's plug....duh!